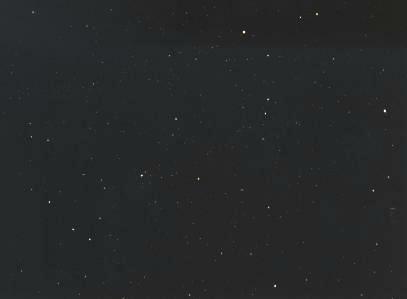 The Great Square of Pegasus (to the right side of the picture) rises like a great diamond over the eastern horizon, the reddish giant star Scheat at the top just to the right of the top center edge. The left-hand star of the Square, Alpheratz, is actually in Andromeda, and begins two lovely strings of stars in that constellation that go down and to the left and off the picture. At the right-hand corner is Markab, at the bottom, Algenib. Sadalbari, which consists of Mu and Lambda Peg lie to the right of Scheat. Psi is to the right of Alpheratz, while Chi is up and to the left of Algenib. 56 Peg is down and to the right of Scheat. See a wide angle view of the Great Square with Cassiopeia, Andromeda, and Cepheus. For more on Pegasus, see Horsing Around at Stellar Stories.